IF YOU'RE LOOKING FOR THE 2017 MONTEREY PORSCHE AUCTION RESULTS, PLEASE CLICK HERE TO BE REDIRECTED. Gooding brings a collection of top-shelf offerings to Monterey this year, and among their crop are two gems which will turn every single head which passes them. Both iconic racing cars of decades gone by, this remarkable pair ought to have the spectators salivating; not just for the eras which these cars helped define, but for their incredible spec and the fortunes they'll command at auction. 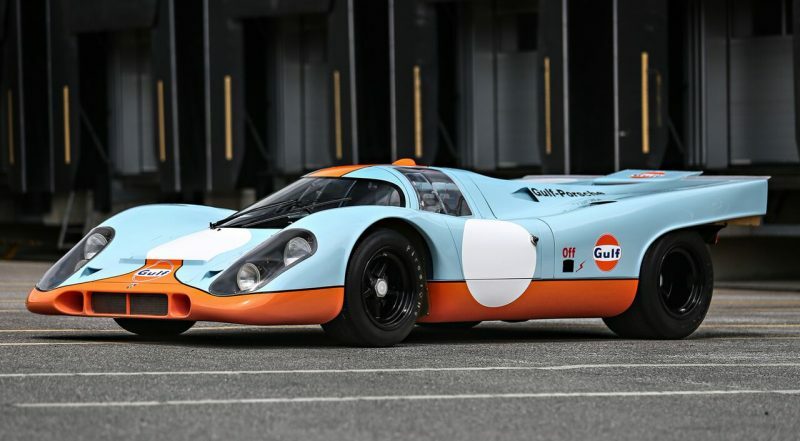 Arguably the most iconic machine to go on auction this year, this Gulf-liveried 917K is a stunner with a past spent on the silver screen. Not only was 917-024 leased to Steve McQueen's Solar Productions for use in the making of the seminal film Le Mans (1971), but it was used extensively for testing in 1970 at Le Mans in the talented hands of Mike Hailwood and and Brian Redman. Part of Jo Siffert's personal collection, 917-024 spent decades in a dusty warehouse outside of Paris until its discovery in 2001. The ultimate barnfind was meant to go to auction back in 2014, but the detailed restoration process prevented it from doing so. Now, with the restoration complete and every detail carefully documented, the car is ready to make its auction debut, where, with its provenance, should have no problem finding a new owner. This immaculate 1994 Carrera RSR, finished in Grand Prix White, won the IMSA GT2 Championship, came second in the Exxon Championship, and clinched Second in Class in the World Porsche Cup in 1994. Powered by a 3.8-liter M64/04 RSR-specific engine, this svelte roadcourse marvel can sprint to 60 mph in a mere 3.7 seconds thanks to the advertised 325 horsepower on tap, though, in reality, that figure is closer to 375 horsepower. That grunt, matched with a chassis weighing roughly 2,600 pounds, allowed for performance that put it at the sharp end of the pack in IMSA GT2, SCCA and PCA events for well over a decade. Despite its colorful history and race results, Chassis 81 has been well-preserved and comes with an extensive spares package including original wheels, electronic control units, suspension parts, and bodywork options, and other documentation such as a Porsche Manufacturer’s Statement of Origin, Porsche Motorsport North America invoices and correspondence, race history, and period photographs. Wednesday 16 August 2017 10:00 a.m. to 6:00 p.m.
Thursday, 17 August 2017 9:00 a.m. to 6:00 p.m.
Friday, 18 August 2017 9:00 a.m. to 9:00 p.m.
Saturday, 19 August 2017 9:00 a.m. to 5:00 p.m.
Other Porsche Offerings from Gooding & Co. Lot 005 – 1956 Porsche Typ 356A Speedster – Estimate: $250,000-300,000. Lot 013 – 1989 Porsche Typ 930S Turbo coupe – Estimate: $325,000-400,000. Lot 015 – 1968 Porsche Typ 911 Targa (soft window) – Without reserve – Estimate: $175,000-200,000. Lot 023 – 1994 Porsche Typ 964 Turbo S 3.6 Flachbau – Estimate: $700,000-900,000. Lot 030 – 1969 Porsche Typ 912 Targa – Without reserve – Estimate: $70,000-90,000. Lot 035 – 1961 Porsche Typ 356B Super 90 Roadster – Without reserve – Estimate: $200,000-250,000. Lot 037 – 2008 Porsche Typ 997 GT3 RS 3.6 – Estimate: $275,000-325,000. Lot 038 – 2011 Porsche Typ 997 GT3 RS 3.8 – Estimate: $475,000-525,000. Lot 039 – 2011 Porsche Typ 997 GT3 RS 4.0 – Estimate: $525,000-575,000. Lot 046 – 1988 Porsche Typ 959 Komfort – Estimate: $1,200,000-1,400,000. Lot 051 – 1963 Porsche Typ 356B Cabriolet – Without reserve – Estimate: $175,000-225,000. Lot 108 – 1954 Porsche Typ 356 Super Speedster – Estimate: $275,000-350,000. Lot 110 – 1989 Porsche Typ 911 Carrera 3.2 Speedster – Estimate: $275,000-325,000. Lot 113 – 1967 Porsche Typ 911S 2.0 Targa – Estimate: $275,000-350,000. Lot 129 – 1964 Porsche Typ 904 GTS – Estimate: $1,500,000-1,800,000. Lot 131 – 1973 Porsche Typ 911 Carrera RS 2.7 Touring – Estimate: $650,000-750,000. Lot 134 – 1963 Porsche Typ 356B Carrera 2 Cabriolet – Estimate: $1,250,000-1,500,000. Lot 138 – 1997 Porsche Typ 993 Turbo S – Estimate: $400,000-500,000. Lot 146 – 1962 Porsche Typ 356B Roadster (twin grille) – Estimate: $400,000-500,000. Lot 150 – 1973 Porsche Typ 911 T 2.4 Targa – Without reserve – Estimate: $140,000-180,000. Lot 161 – 1967 Porsche Typ 911S rally car – Without reserve – Estimate: $200,000-250,000. Lot 169 – 1984 Porsche Typ 930S Slantnose – Estimate: $275,000-325,000. Lot 174 – 1959 Porsche Typ 356A Convertible D –Without reserve – Estimate: $180,000-220,000. Lot 178 – 2011 Porsche Typ 997 Speedster – Without reserve – Estimate: $225,000-275,000. Bonhams brings a stable of delectable 356s to Monterey in 2017, and one tractor. Yes, you read that correctly—on auction is a classic piece of agricultural machinery which might take the dedicated Porschephile by surprise. Expected to wrangle somewhere between $45,000 and $60,000, this 1961 Porsche Junior 108 tractor might be one of the few unknowns which can offer a unique blend of whimsy, exclusivity, and a glimpse into Porsche's foray into the agricultural segment. Powered by a 14-horsepower diesel engine, this quirky little gem might be the least powerful machine at Monterey 2017, but it ought to be a crowd pleaser. Wednesday, 16 August 2017 and Thursday, 17 August 2017: 9:00 a.m. to 6:00 p.m. Lot 33 – 1965 Porsche Typ 356SC 1600 coupe – Without reserve – Estimate: $130,000-160,000. Lot 35 – 1957 Porsche Typ 356A 1600 Super Speedster – Estimate: $475,000-550,000. Lot 57 – 1961 Porsche Typ L108 Junior Tractor – Without reserve – Estimate: $45,000-60,000. Lot 64 – 1956 Porsche 356A 1600 Speedster – Without reserve – Estimate: $375,000-325,000. Lot 92 – 1955 Porsche 356 1500 Continental coupe – Estimate: $190,000-260,000. Lot 100 – 1964 Porsche 356SC 1600 Cabriolet – Estimate: $190,000—230,000. Lot 106 – 1965 Porsche 356C 1600 Cabriolet – Without reserve – Estimate: $120,000-150,000. Of all the cars on offer from this house, the one which ought to garner the most attention is their pristine 993 GT2. This monster, nicknamed "The Widowmaker," struck fear in the hearts of many and was Porsche's last turbocharged 911 homologated for motorsports, most notably for the BPR Endurance Series, and later for FIA GT. Due to the cult appeal of this car, the limited numbers (only 57 road cars were ever built), and the rising value of the 993 market, this GT2 shouldn't have any problem selling north of the million-dollar range. Wednesday, 16 August 2017 and Thursday, 17 August 2017 10:00 a.m. to 8:00 p.m.
Friday, 18 August 2017 and Saturday, 19 August 2017 10:00 a.m. to 4:00 p.m. Lot 112 – 1975 Porsche Typ 914 1.8. – Without reserve – Estimate: $40,000-50,000. Lot 115 – 1969 Porsche Typ 911S Targa – Without reserve – Estimate: $175,000-225,000. Lot 119 – 1989 Porsche Typ 911 Carrera 3.2 Speedster – Without reserve – Estimate: $175,000-250,000. Lot 129 – 1973 Porsche Typ 911 Carrera RS 2.7 Lightweight – Estimate: $875,000-950,000. Lot 137 – 1995 Porsche Typ 993 GT2 – Estimate $1,100,000-1,400,000. Lot 139 – 1967 Porsche Typ 911 S coupe – Without reserve – Estimate: $225,000-275,000. Lot 153 – 1997 Porsche Typ 993 Turbo S – Without reserve – Estimate: $375,000-450,000. Lot 159 – 1973 Porsche Typ 911 Carrera RS 2.7 Touring – Estimate: $650,000-850,000. Lot 164 – 1997 Porsche Typ 993 Cup 3.8 RSR – Without reserve – Estimate: $500,000-550,000. Lot 230 – 2015 Porsche Typ 918 Spyder – Estimate: $1,200,000-1,600,000. Lot 235 – 2011 Porsche Typ 997 GT3 RS 4.0 – Estimate: $425,000-525,000. Lot 247 – 1951 Porsche Typ 356 1500 coupe – Estimate: $600,000-700,000. Lot 250 – 1992 Porsche Typ 964 Carrera RS – Without reserve – Estimate: $325,000-375,000. Lot 255 – 1995 Porsche Typ 993 Carrera RS Clubsport – Without reserve – Estimate: $400,000-500,000. Lot 256 – 1970 Porsche Typ 908/03 – Estimate: $3,500,000-4,500,000. Lot 259 – 1958 Porsche Typ 356A Speedster – Estimate: $325,000-425,000. Lot 264 – 1979 Porsche Typ 930 Turbo – Without reserve – Estimate: $225,000-275,000. Lot 268 – 1974 Porsche Typ 911 Carrera 2.7 M.F.I. – Without reserve – Estimate 225,000-275,000. Mecum brings a wide variety of Porsche to Monterey this year. Perhaps the mos striking of their group is the 4.0-liter Brumos Edition Cup Car, which is a must-have for any die-hard 911 racer. This 2012 Porsche 911 GT3 Cup 4.0 is one of the last five U.S.-specification GT3 Cup cars built by Porsche that year, all of which were offered by Porsche’s long-time American racing partner, Brumos Porsche. Test driven and approved for delivery by Hurley Haywood, this very exclusive Brumos Commemorative Edition Porsche GT3 qualifies for SCCA, Porsche Club of America, and Porsche Owner’s Club competition. Lot T79 – 1987 Porsche Typ 924S coupe – Estimate: $25,000-35,000. Lot T108 – 1987 Porsche Typ 911 Carrera 3.2 Cabriolet – Estimate: $70,000-80,000. Lot F10 – 2007 Porsche Typ 997 Turbo coupe – Estimate: $60,000-70,000. Lot F21 – 1998 Porsche Typ 993 Cabriolet – Estimate: $95,000-125,000. Lot F23 – 1999 Porsche Typ 996 Carrera Cabriolet (with hardtop) – Estimate: $12,000-18,000. Lot F32 – 1988 Porsche Typ 911 Carrera 3.2 Cabriolet – Without reserve – Estimate: $40,000-50,000. Lot F51 – 1965 Porsche Typ 356 C Cabriolet – Estimate: $150,000-175,000. Lot F54 – 1988 Porsche Typ 930 Turbo coupe –Estimate: $150,000-175,000. Lot F66 – 1989 Porsche Typ 911 Carrera 3.2 Speedster – Estimate: $200,000-250,000. Lot F88 – 1965 Porsche Typ 356SC coupe – Estimate: $180,000-225,000. Lot F105 – 1973 Porsche Typ 911 2.4 Targa – Estimate: $90,000-100,000. Lot F112 – 1965 Porsche Typ 356SC coupe – Estimate: $65,000-85,000. Lot F117 – 2012 Porsche Typ 997 GT3 Cup 4.0 Brumos Edition – Estimate: $425,000-500,000. Lot F126 – 1975 Porsche Typ 911 Carrera 3.2 Targa (slant nose/wide body conversion) – Estimate $65,000-85,000. Lot F127 – 1978 Porsche Typ 911SC racecar – Estimate: $60,000-80,000. Lot F136 – 1995 Porsche Typ 993 Cabriolet – Estimate: $60,000-80,000. Lot F137 – 2010 Porsche Typ 997 GT3 – Estimate: $100,000-120,000. Lot F139 – 1965 Porsche Typ 356 Resto Mod – Estimate: $275,000-350,000. Lot S26 – 1973 Porsche Typ 911 RS Carrera 2.7 Lightweight – Estimate: $1,300,000-1,400,000. Lot S33 – 2008 Porsche Typ 977 GT3 RS – Estimate: $250,000-275,000. Lot S43.1 – 1984 Porsche Typ 930 Ruf BTR – Estimate: $200,000-250,000. Lot S59 – 2016 Porsche Typ 991 R coupe – Estimate: $450,000-500,000. Lot S61.1 – 2012 Porsche Typ 991 Turbo S Cabriolet 918 Spyder Edition – Estimate: $150,000-200,000. Lot S62 – 1964 Porsche Typ 356C coupe – Estimate: $125,000-150,000. Lot S63 – 1989 Porsche Typ 930 Turbo Cabriolet – Estimate: $275,000-350,000. Lot S64 – 1976 Porsche Typ 934/935 IMSA racecar – Estimate: $800,000-1,000,000. Lot S68 – 1996 Porsche Typ 993 GT2 coupe – Estimate: $1,600,000-1,900,000. Lot S81 – 2011 Porsche Typ 997 GT2 RS – Estimate: $450,000-500,000. Lot S83 – 2004 Porsche Carrera GT – Estimate: $1,100,000-1,250,000. Lot S86 – 2011 Porsche Typ 997 Speedster – Estimate: $350,000-400,000. Lot S89 – 1986 Porsche Typ 930 Turbo coupe – Estimate: $140,000-180,000. Los S90 – 1977 Porsche Typ 935 racecar – Estimate: $1,600,000-1,750,000. Lot S91 – 1979 Porsche Typ 930 racecar – Estimate: $55,000-70,000. Lot S92 – 1992 Porsche Typ 964 RS Carrera Cup (Andial conversion) – Estimate: $415,000-500,000. Lot S93 – 1974 Porsche 911 Carrera Targa – Estimate: $90,000-125,000. Lot S96 – 1967 Porsche Typ 911 Deluxe RS (1 of 253) – Estimate: $200,000-235,000. Lot S98 – 1994 Porsche Typ 964 Turbo S – Estimate: $1,150,000-1,300,000. Lot S99 – 1977 Porsche Typ 934.5 IMSA racecar – Estimate: $750,000-1,000,000. Lot S107 – 1991 Porsche Typ 964 Turbo – Without reserve – Estimate: $140,000-180,000. Lot S113 – 1988 Porsche Typ 959 Komfort – Estimate: $1,200,000—1,400,000. Lot S114 – 1995 Porsche Typ 993 RS – Estimate: $500,000-600,000. Lot S115 – 1958 Porsche Typ 356A Speedster – Estimate: $350,000-400,000. Lot S117 – 1996 Porsche Typ 993 Turbo – Estimate: $200,000-250,000. Lot S132 – 1995 Porsche Typ 993 Carrera (modified) – Estimate: $75,000-85,000. Lot S140 – 1959 Porsche Typ 356A Convertible D – Estimate: $250,000-300,000. Lot S143 – 1962 Porsche Typ 356B Super 90 Roadster (twin grille) – Estimate: $300,000-400,000. Lot S153 – 2002 Porsche Typ 996 GT2 – Estimate: $175,000-190,000. Lot S165 – 1973 Porsche Typ 911E Targa – Estimate: $100,000-125,000. Russo and Steele's eclectic collection of Porsches ought to have any stripe of automotive fan interested, but those with an eye for appreciation will take note of the exclusive 911 R in their stable. Like all their offerings, the estimate for the 911 R is not listed, but expect this thoroughbred to fetch north of the half-million mark. Wednesday, 16 August 2017 10:00 a.m. to 4:00 p.m.
Thursday, 17 August 2017 10:00 a.m. to 3:00 p.m. Your article indicated the auction results were in but the attached list is only for the auction preview estimates. Hope to see a follow-up where the final auction sales list can be viewed. Do you have the results? How do I access them? Thanks, I appreciate your weekly articles. If you saw the comments above, you probably saw the responses, too.